*This was an assignment for English Composition to create a podcast about something you care about. This is mine after many revisions and incorporating notes from my teacher. A written transcript of the podcast is below, but if you can, listen first! This voice? The one that you’re hearing read these words? Yeah, that one. It isn’t my voice. It’s my mom’s. You’re probably wondering why a teenage girl would want her mom to read what she’s written. In my case, it’s because I can’t read what I write out loud. There’s not a direct line between my brain and my mouth. It’s more like an elaborate maze. I can’t speak so people understand what I mean. If asked a question, my mouth says things that do not answer the question. My brain doesn’t think in words the way most people’s do. Names of things and people get handed to me instead of the words that would make sense to the person questioning me. Sometimes I blurt out whole sentences from another time in my life. (Emma’s voice) “I bounce a balloon to Emma. I bounce it back to me.” They may be images that remind me of the person I’m with or where I am, or words I’ve heard spoken by others, things that get caught in my mind, or unrelated scripts, but that convey the exact emotion I’m feeling. (Emma’s voice) “No more ice skating. Ice skating’s gone.” In any case, what I manage to say usually baffles the people I am speaking to, causing them to misunderstand me. Not being able to speak what’s in my heart so that others are able to understand can be challenging, but I can type things that I cannot reliably say. There are computer generated voices that say the letters as I type them and sound like this – (Computerized young girl’s voice) “I am your friendly computerized female voice. I sound like I’m maybe five years old.” (Another computerized young girl’s voice) “Or I can sound like this and pretend I’m British. But yeah, it’s just not me.” Or I can sound like this. Okay it’s not my voice, but with some direction, Mom sounds better than a computer. Imagine for a minute that you can’t talk to people in any way that makes sense to them or you. Imagine if every time you opened your mouth to speak other words tumbled out. If you are like me, you might get used to not answering people’s questions or being able to stay on topic. So what would you do? How would you interact with people? Would you ignore their questions? Pretend you didn’t hear them? How would you express yourself? Maybe you would try to connect with scripts you’ve memorized, things you’ve heard other people say in similar situations or maybe you’d find non-word based ways to communicate. That’s what I do. Music is my first language. It is a friend who loves me unconditionally. It’s there when I need it and does not shed a tear if ignored for some time. Music is a positive force as it stands by my side. I like hearing the same melodies repeated and did so even when I was very young. It’s been a comfort to me as long as I can remember. Music grounds me and plays a huge role in seeking my creativity as it allows me to perform as I choose to. It’s a way to communicate; it gives me hope, tells me I am not alone and inspires me to create. Though people respond differently to music, I believe there are always emotions involved. Music has the ability to transform my fearsome thoughts laden with anxiety and stress. (Music fades out) It calms me and this has been the case throughout my life. When singing lyrics I stumble and have trouble articulating the words, (Lose Yourself – Eminem) but I can remember the sounds I hear and recreate them with my voice. When I sing I am not apart from, but instead am part of. Music can be both private and public, but it needs to be loud. (Music gets louder) No one composes music in a whisper. My body needs to feel the beat so that I can be consumed by it. (Volume increases steadily and then fades) When that happens I become part of the music, like another instrument or an extension of it. I jump and dance and move. My arms swing or are raised up and my head bops, my whole body keeps time to the beat. I’m transported to another reality and it is in this alternate reality that I am most happy and comfortable. At home my need for high volume can cause problems because the members of my family have differing sensory needs that come in direct conflict with mine. (Heartless – Kanye West) My older brother has to have music as background, while I perform alongside, so it makes sense for mine to be public and his to be private. My mom and dad both work at home and need quiet in order to concentrate. I am told to wear headphones, which encumber my movement and dilute my experience. My family has worked out a solution that allows me to commandeer the living room in the evening. For several hours I am blissfully able to indulge my love of loud music and dancing while my brother stays in his room or hangs out with my parents in theirs. Until about a year ago I didn’t know the joy of creating music. Until then I was an audience member, but not a participant. My parents encouraged my love of music and hired teachers to help me expand my interests. Guitar is beautiful to listen to, but it is difficult for my fingers to recreate the sounds flowing through my mind. Piano is also hard and requires dedication and lots of practice, but I think it’s a better fit for me. Singing is easy and my lack of inhibitions, great sense of tone and ability to mimic sounds I hear makes it the best choice of all. Eliot is my piano teacher and Karen is my singing coach. Eliot came first. (Gimme Resurrection – Anya Marina) Karen and I have great fun together. I feel at ease in her presence, which is important when you are learning new things and trying to be creative. Eliot and Karen have taught me to be patient with myself. From them I have learned how hard it is to become masterful and yet I’ve decided it’s better to love the process of learning as much as the final product. Communicating isn’t just talking, it’s developing a connection with another. Music connects us all. I wrote these lyrics and composed this melody, so this voice? Yeah, this one’s mine. the girl is going outside. Who is this girl I see? Who is that girl I see? Dare to be the leading girl! the girl is a teenager. Do you believe in me? Please do believe in me. Do, do, do, do, do, do…. Do You Prefer Writing to Speaking? I think a great deal about writing and how I write less because it feels like a choice and more because it is a need. I am far more comfortable writing than I am speaking, though people who know me well may find this surprising as I certainly can go on and on about things I feel passionate about. Writing is the most honest way I can communicate. When I am speaking to another person(s) I am easily caught up in the emotional exchange, whether it is verbal or not is of little consequence. I am all too aware of the other person’s tone, their facial expression, the volume they are using, the emphasis they place, the way they move as they are speaking and together with the words that come out of their mouths I make interpretations about what they really mean. I’m sometimes wrong, sometimes I’m right, but most of the time I have no idea whether I’m right or wrong because I cannot ask to verify my conclusions. If someone raises their voice in anger, I cannot “hear” them. Literally, they could be saying anything to me, but I cannot hear their words above the “anger tape” that is embedded in my brain and clicks on when they begin to shout. The anger tape is ugly and cruel, words are brandished as weapons and used to make deep, painful cuts that take my breath away. Once the tape begins to play it is almost impossible for me to turn it off. Still I’ve gotten better and can even say, “I can’t hear you, when you’re yelling.” Sometimes that works, sometimes it doesn’t, even so it’s better than remaining silent. I think about these things a great deal because of my daughter, who cannot access language easily. I think about communication and how much of it has nothing to do with actual words. I think about how I am 52 years old and am just now beginning to really make strides in how I communicate with spoken words in the face of anger and upset. Writing though, writing is different. I can think about the words, I can use metaphor, simile and punctuation to enhance. I can take my time. I can savor and wallow, I can perseverate. Words are little sparks, placed together they can sputter and die or surge forth creating something unexpected and beautiful. Some days it’s easier, the words flow readily and easily. Whatever I’m writing about takes on a life of its own, the words spill out, paragraphs come together. On days like that it all feels magical. But there are other days when I write and delete, I agonize, the words do not obediently fall into place, they are stubborn, they scatter or elude. I must remind myself to breath and refocus. But I am dogged and know from years of practice the written words will come if I’m patient. However with the internet and social media written communication is presenting some of the same problems I have with speech. If I’m having a written conversation with someone it can go too quickly for me. I can’t take the time and care I want or need to say things in a way I’ve intended. I can get swept up in the emotional content of the words being written, either my own or the other person’s and I become easily confused. Sometimes I perceive the written words in the same way I do when someone begins yelling and I can no longer process what they are saying. The anger tape has clicked on, the volume is so loud, the content so cruel I’m transported to that miserable place of feeling all my worst fears are being confirmed. I have thought of this as an “anger tape” but another apt word for what happens to me is what is called “scripting”. This is a word used often regarding autism; my anger tape is most definitely a script. And once it’s been activated it is almost impossible for me to turn it off. I welcome these insights. So much about autism is covered in thick layers of seemingly impenetrable “otherness”. That puzzle piece used to symbolize Autism isn’t doing any of us any favors by the way, but that’s worthy of a whole post all on its own. Whenever I discover things I have experienced, things I know about myself that give me clues into what my daughter or my friends who share her neurology may be experiencing, I am grateful. I need these insights to help me understand, but also to help me progress and grow as a writer and human being. 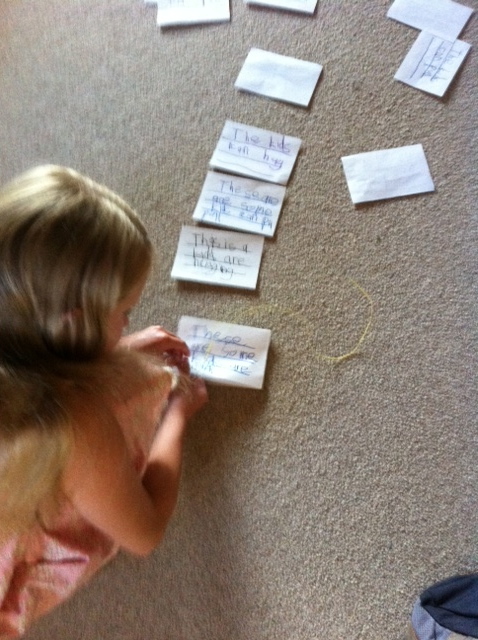 Emma’s teacher and I have been brainstorming new ways to increase Emma’s reading comprehension. We have tried the standard reading comprehension questions, which, as my friend Ibby pointed out, are typically filled with inconsistencies and problems. We’ve tried the more standard reading comprehension questions such as a story about a boy named Peter who takes a taxi to the airport. He gets on an airplane, buckles his seat belt and the plane takes off. The questions are then, “Who took a taxi?” The answer, obviously is Peter took a taxi. But the second question, “Where was he going?” is tougher to answer because we aren’t given the destination other than he took a taxi to the airplane and that isn’t actually accurate as he took the taxi to the airport, but the airport isn’t part of the story. It tells us he took a taxi and then got onto the airplane where he buckled his seat belt, so Emma answered, “Going to visit Granma in Aspen!” And while this isn’t the answer the creators of the questions were presumably looking for, it demonstrates that Emma certainly understands what the story is about and she is adding her own personal experience to the gaping holes the story provides. In addition, the story has been dumbed down so completely, if we are “presuming competence” then Emma must be going out of her mind with boredom. So this is the question I come up against almost constantly – how do we make the material interesting and engaging, but not so difficult it becomes frustrating. How do we set Emma up to succeed and not fail without boring her? How do we deal with her resistance to reading and writing? I’ve made some headway by trying to do some playacting and using some of her favorite songs, but reading itself remains difficult for Em and she certainly doesn’t enjoy it. Maybe I am making it too complicated. Maybe I’m over-thinking the whole thing. Maybe it’s better to just present reading material and have her read it silently. Then type questions that she types the answers to. Maybe having her read aloud is causing problems. What I am seeing over and over is that when she has trouble with a text we make the text easier, but I don’t believe that’s the answer. I’m not sure making it “simpler” is better. My biggest challenge with all of this is that this is not my area of expertise and I have no idea how to proceed. Emma’s teacher continues to try different things, but we haven’t found anything that seems to captivate, motivate or particularly interest her. I have to think about this more. I’ve printed out some of her favorite song lyrics, but there were too many words she couldn’t read and so much slang, I quickly abandoned the idea. I need to find reading material that isn’t so easy it’s boring and not so difficult it makes her frustrated. Looking back over the past year, I can see how well she was doing and how so much of that progress has stopped. I need to revisit those earlier concepts and see if I can find material that will pick up where we left off. This is the story Emma made up and wrote this morning before she went to school. I had to give her support a couple of times when she would say a word, such as “the” or “to” but then would forget to actually write it and wrote the next word (always a noun or verb) instead. According to Dr. Marion Blank, the woman who created the literacy program we have been using with Emma for the past nine months, children on the spectrum dislike non-content words. Emma then took her story over to her dad and read it to him! We first met Dr. Blank almost a year ago now. Before that first meeting we both read her book “The Reading Remedy” and were impressed by it. In January of 2011 we began implementing her program with Emma. During those first few months we worked on the beginning of letter formations and sequencing. In April Emma was able to form all the letters of the alphabet and we began the first level of the literacy program. Over the last seven months Dr. Blank has added other elements to the program, specifically designed for Emma so that we now are working on a spoken language program in conjunction with the literacy piece as well as the Phonics Plus Five and Reading Kingdom programs. 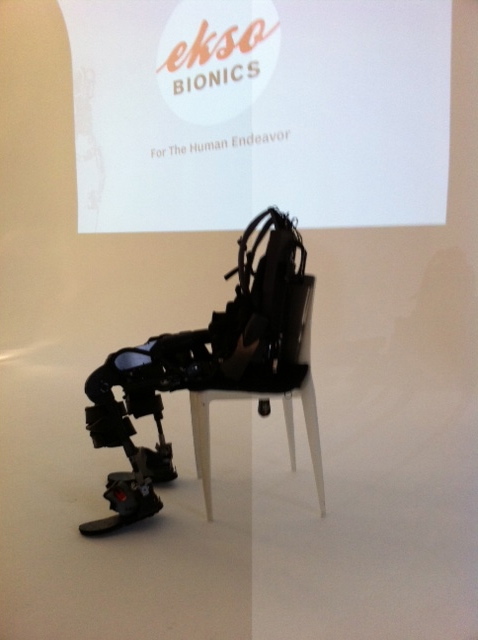 Last night Richard and I went to a launch party here in New York City of Ekso Bionics with a live demonstration by Amanda Boxtel. 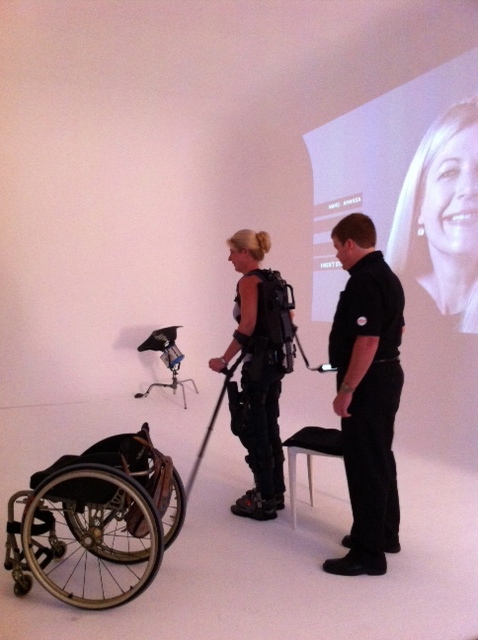 Amanda was in a skiing accident over 20 years ago, which left her a paraplegic. For more than two decades Amanda has lived her life from a wheel chair. This photo is out of focus and does not do Amanda justice. This quote is from Amanda’s website. 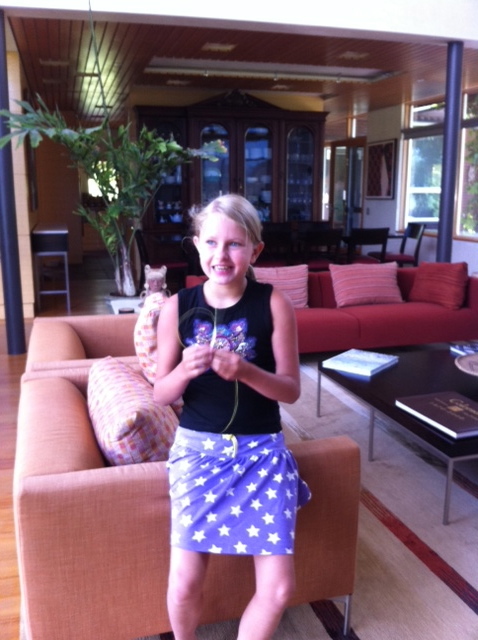 When we took Emma to Costa Rica for her first stem cell treatment, fluid seeped from her spine into her blood stream. Suddenly she was in excruciating pain and Richard and I were terrified. Amanda wrote me and her letter, one of many I have kept, was a calm voice of strength and reassurance. Amanda has been to India six times for stem cell treatments. She is an inspiration and source of hope for all. Watching Amanda stand and then walk last night was a visual confirmation of what is possible in this world, if we never give up. I think of Amanda often as I work with my daughter, Emma. Writing is difficult for Emma, it does not come easily. But then walking does not come easily to Amanda either and yet she has never allowed that to slow her down. 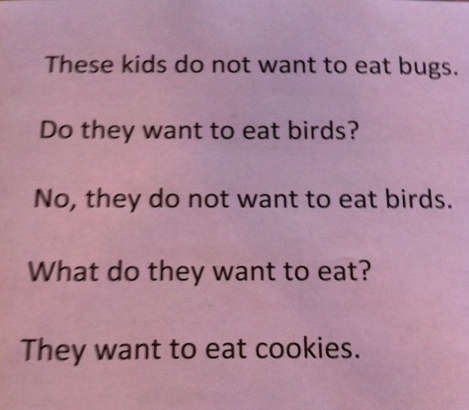 Yesterday afternoon, Emma said, “These kids do not want to eat bugs.” Then she squinted her eyes and laughed, making her shoulders shake up and down. It was a creative version of some of the work we’ve been doing during her literacy program. 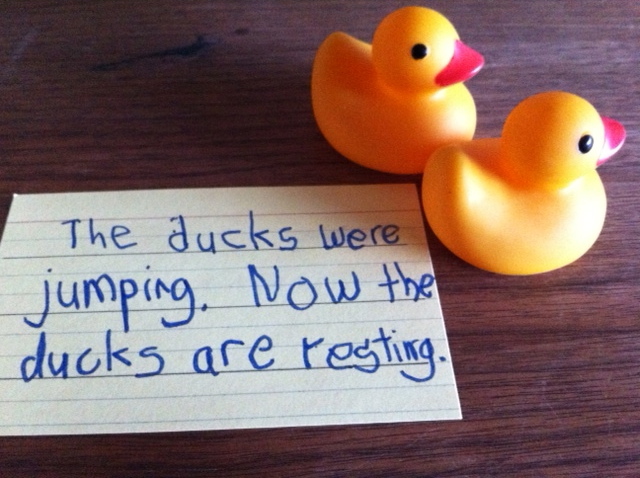 We’ve been working on sentences such as – These are kids, they want to rest. They are resting. Or This is a plane. It can fly, but someone has to make it fly. “That’s funny, Em. Let’s type that.” I pulled the computer forward and gestured toward it. Emma giggled and shook her head no. I pushed the computer toward her. “Type,” I said. “No, they do not want to eat birds,” she wrote, being sure she made an upper case “n” for the start of the sentence. “What do they want to eat?” I typed. Emma looked at me. I shook my head, putting a finger to my lips and pushed the keyboard toward her. Cookies is not a word we’ve covered yet, so I held her hand and helped her type – cookies. As we have added more work to Emma’s already busy schedule, I have had to adjust my own schedule to accommodate. Since her new school year began this week, I am now doing her literacy session before the bus comes to take her to school in the morning, while Richard gets Nic ready. Yes, they most certainly are! The beauty of this is that all of it is done non-verbally. Emma is able to concentrate fully on answering the questions posed by either writing or typing the sentences on the computer. Today she learned how to use the shift key while hitting the appropriate letter to create an upper case letter to mark the beginning of a sentence. 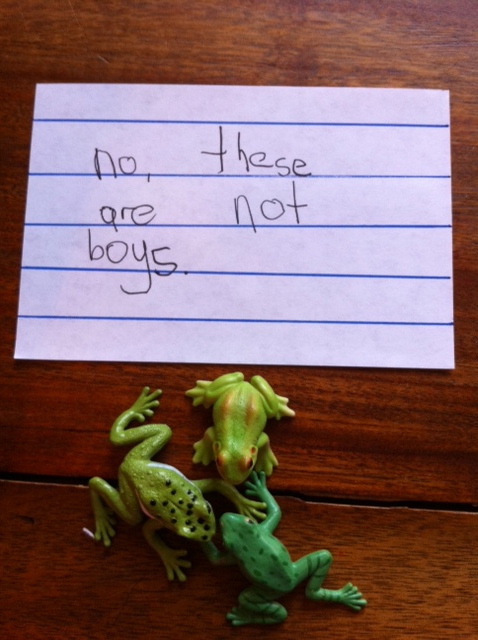 The grin on her face when she wrote: “Here are some boys. They are sitting.” complete with punctuation and upper case letters for the “H” and the “T” was as close to euphoria as one can get. She even giggled when she was finished and beamed at me with pride. This is the dress Emma chose to wear to school today. 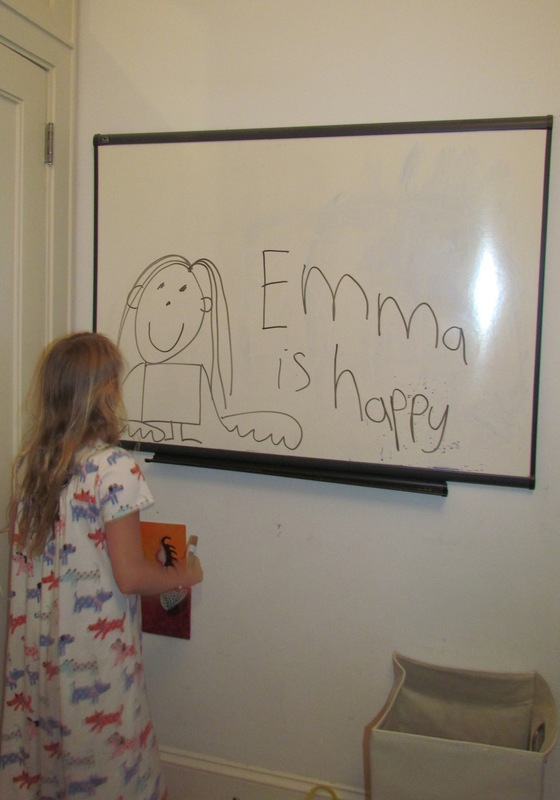 We have been working intensively with Emma on her reading, writing, typing and more recently math and verbal skills. The reading, writing and typing program we began in January. It was at this time that she painstakingly learned how to form each letter of the alphabet. This morning Emma wrote this, in answer to the written question – Did the cat jump? – after I had made the cat jump. In accessing Emma’s progress, I need to compare her to herself and not other children. I have seen over the years how easy it is to become discouraged when I compare Emma to her brother or any neuro-typical child or even other children on the spectrum – unless they are much more severe. “This isn’t going to be a sprint,” Richard once observed, after seeing yet another neurologist. And it isn’t. Emma is making slow and steady progress. We work with her for about three hours every day on her literacy, math and verbal exercises. There has been no instantaneous miracle. She has not begun to write on her own in complete, complex and revealing sentences. She has not gotten to the point where she is able to tell us what it is like for her to be her. She cannot answer questions regarding anything remotely abstract. (Which doesn’t mean I don’t continually hold out hope that one day she will. I do.) But at the moment, I am happy to reflect on her slow, steady progress and it fills me with joy to work with her each morning and to see these beautiful sentences that she constructs on her own. Someone once asked me – Is it good enough? The idea being that I had a preconceived notion of how I wanted something to be and anything short of that meant it was an utter failure. Sometimes being “good enough” is still pretty fabulous. So yes – Emma’s progress is good enough. In fact, it’s better than good enough, it’s wonderful. We are leaving soon. Back to New York City where our other life awaits us. The children need to get ready for a new school year, medical forms need to be filled out, bus companies need to be contacted and confirmed, school supplies need to be bought. Nic will be entering 6th grade and there’s a certain excitement in that. Emma doesn’t enter a “grade”. She will be placed in a class with other children on the spectrum, who are near to where she is academically. I am always filled with trepidation at the start of a new year regarding Emma. It is difficult not to give in to fears and worries. Will she excel? Will her new teacher and classroom be a good fit? The truth is, Emma has progressed more in the past seven months than she has in five years. We attribute this to the literacy program we began in January of this year. We have now added a math program as well as a verbal program. Emma is working each day for about three hours on these various programs. It has been amazing to witness. Progress. This is the word every specialist we’ve ever spoken to has used. Is she progressing? And the answer to that question is a resounding – Yes. We cannot predict what the future holds for Emma. We cannot know how far she will go. But as long as she continues to progress we know we are on the right track. I heard someone say once – Progress, not perfection. It’s an apt thought for any of us. It is easy to see what’s wrong – with the world, with other people, with ourselves. 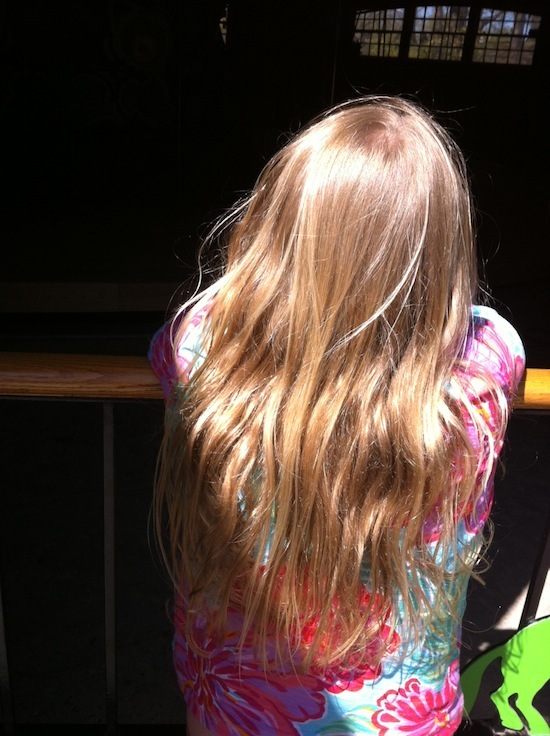 When Emma was diagnosed with autism we were told about all that was “wrong” with her. Her deficits were listed with great care: Her eye contact was weak. She showed little interest in interaction with others, she didn’t point, she didn’t ask questions about others, she showed little awareness of others, she seemed oblivious to others pain or feelings. Her verbal skills were delayed, her fine motor skills were delayed, her ability to play, to project, to engage in any sort of fantasy or pretend play was almost non-existent. The list went on and on. But what of her assets? What about all the things she did that showed tremendous creativity and intelligence? Where was the balance in her many and varied evaluations? When Emma went to a Special Education Pre-School I met a little boy who couldn’t have been older than three. He was pointing to all the signs in the building and reading them. I exclaimed to one of the therapists standing nearby how incredible this seemed to me. She then told me he was hyperlexic and that they discouraged him from reading as it wasn’t “normal”. I have never forgotten that. Here was a child with an unusual ability. A talent that could be used to further his education and perhaps interests and yet it was being discouraged. Is that what we want from our children – to be “normal”? What do we sacrifice in our attempts to “fit in”, to adapt, to be like everyone else? Emma has a beautiful voice and a love of performing. If we have guests over she asks to “sing a song” for them as she did last night. Sometimes she needs to be reminded that the song must eventually end as she can get into a loop, singing the same refrain over and over again. She hasn’t mastered the whole concept of “losing ones audience”. 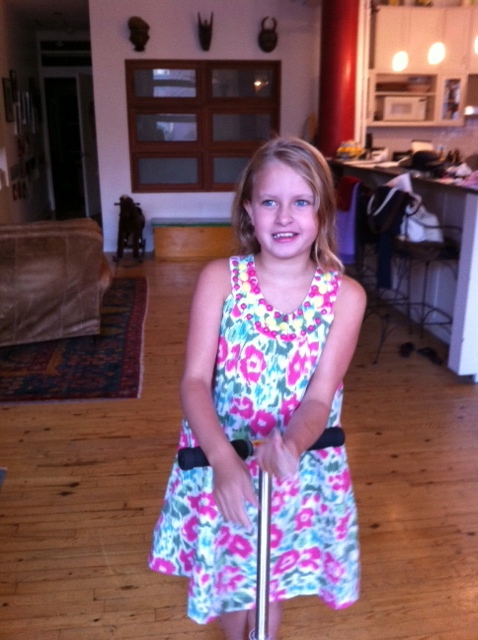 But we encourage her singing and desire to perform just as we encourage Nic to practice his Alto Sax and the piano. Emma has a great many assets, things she loves doing over and over again. With Nic we use the word “practicing”, with Emma we say she is “perseverating.” Yet in her perseveration Emma is practicing as much as Nic is. The difference is, Emma will do the same thing over and over again for hours, whereas Nic will practice for 20 or 30 minutes and move on to something else. Last night as guests began to arrive, Emma was upstairs in her “study room”, sitting on the floor in her party dress writing. When I went upstairs, this is what I saw. She was talking to herself and picking up each piece of paper then reading it before placing it back down and moving to the next. 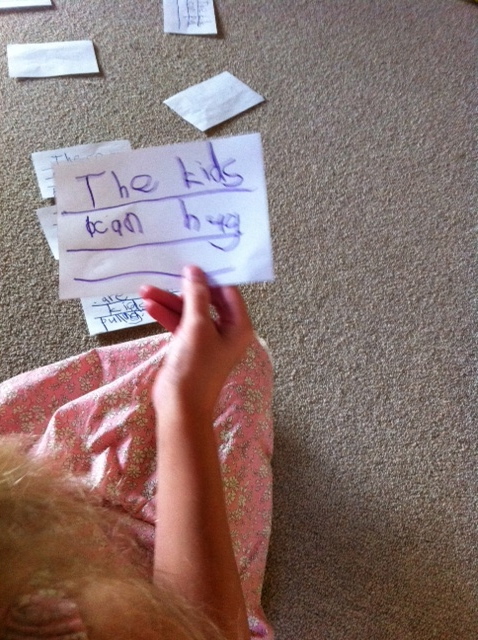 As we had run out of lined paper, she had made the lines herself, before writing the sentence – The kids can hug. Now this scene isn’t exactly “normal”, on the other hand very little in our household is. Inevitably in life we have all experienced things that have forced us to slow down, perhaps take another route, do things differently than we would have liked. I think of these things as bumps in the road. I try to refrain from judging them as good or bad, but just as the way things are. There are some moments I’m better at achieving this kind of calm perspective than others. It’s easy for me to feel all that is happening at work is “horrible”, but the truth is, a series of events have been set into motion and I have had to make the decision to fight back, to defend myself or allow another person to harm me and in harming me, harm my family. Emma experiences her own “bumps” along the way. Things that happen, which force us to change well laid plans. Plans she is excited about and is looking forward to. But more and more, lately, Emma has taken these things in stride. She is learning to adapt to a world that is often precarious, constantly changing and shifting. It is a wonderful thing to witness. We all must adapt to our ever changing circumstances. 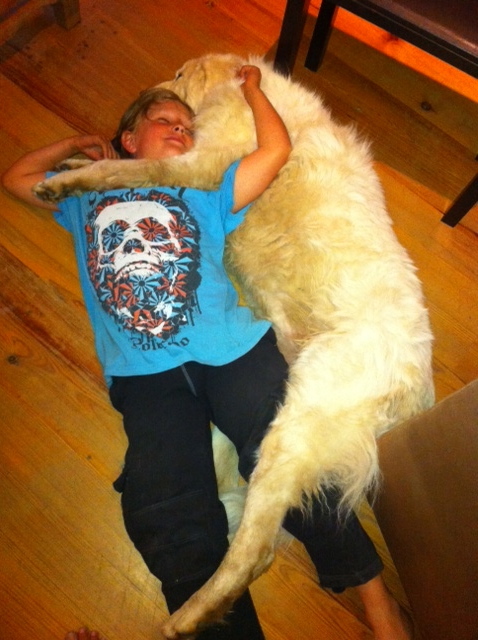 Emma makes me happy – Both my children do. Try not to smile while looking at this next photograph. I dare you. No smiling. Come on, it’s impossible not to feel a tiny degree of joy, right? I love that. Here’s another photograph that can’t help but bring a smile to my face. This was done yesterday during Emma’s “study room”. She is writing longer and more complex sentences. Her reading is coming along beautifully. Excuse me while I jump up and down with excitement! So no matter how heinous things get at work, I have my family. My beautiful, amazing family – and that’s all I need to bring things into the proper perspective. 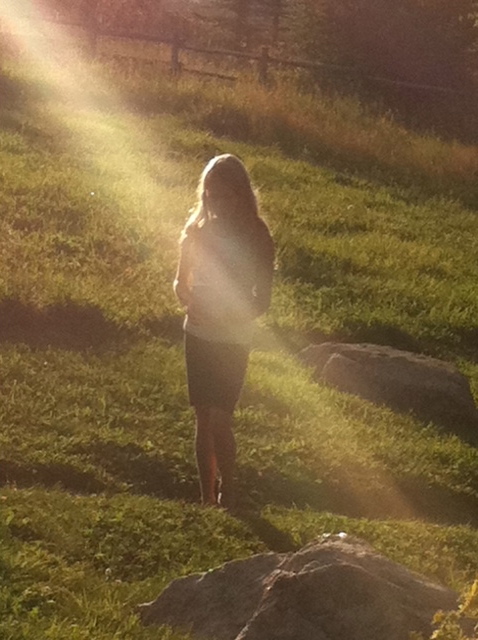 I have maintained in previous posts, that I continue to believe in my daughter’s brilliance. Current IQ tests do not account for children who are non-verbal or with limited or impaired speech. I have no way of knowing what Emma’s IQ is, but I can tell you there are things Emma does, on a daily basis, indicating her mind is capable of some pretty astonishing leaps. What follows are a number of examples. Our refrigerator light is out. The first thing I did was replace the bulb, only to find that wasn’t the problem. A little later Emma opened the refrigerator door and pressed a switch on the ceiling of the refrigerator and immediately all the lights came back on. “Wow Em! How did you know to do that?” I asked incredulous. “Lights broken,” Emma said, nodding her head up and down as she removed her caramel yogurt from the frig. “Yeah, but how did you get them back on?” I went over to her and watched as she reopened the door and pressed on the little white button that activates the lights when the door is opened, something I did not realize until Emma showed me. The lights flickered for a second and then went out. Emma reached up and matter-of-factly jiggled the switch and the lights came back on. “There,” she said, with a certain degree of satisfaction. After a few days of all of us wiggling the switch, the lights flickered on and off feebly one last time before remaining permanently off and I had to call the company to get the light switch replaced. Now to many of you, this may seem completely commonplace, but I can tell you, I had spent quite a bit of time trying to figure out what was causing the problem. I should have saved my time and just asked Emma. Yesterday while Emma and I worked on her literacy program requiring her to choose the word “leg” from several options, she positioned the cursor over the correct button then clicked on the space bar. Then she looked over at me with a mischievous grin as if to say – did you see that? Again, hitting the space bar instead of clicking on the mouse or the return key never would have occurred to me. Another thing I’ve noticed while working with Emma is that she has an amazing ability to see patterns. So, for example, if I show her a series of “words” but with only parts of the letters showing such as: _a_s, r_ _ _, _e_ _, _ _s_ and ask her to find the one that can be “eats” she will find the correct one immediately, less than a second, faster than I am able to. I am consistently amazed by this. 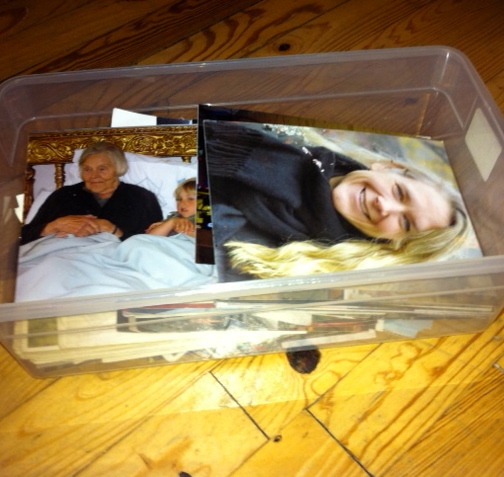 It is in keeping with her ability to know instantly when a photograph is missing from her pile. The other day Emma was singing while shooshing around on her scooter. Richard was reading in the rocking chair, Merlin happily nestled in his lap. “You know what she’s doing right?” Richard said looking over his reading glasses at me. “Yeah,” I said without looking up. I stopped reading and watched and listened. 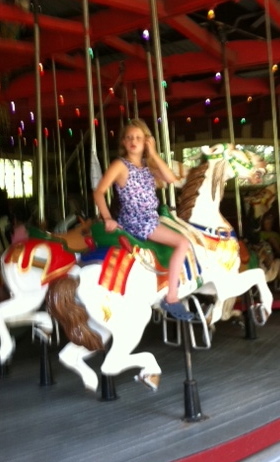 Emma was currently singing “Georgy Girl” one of the many songs they play at the Central Park Carousel. These are only a few examples of Emma’s brilliant mind. There are countless others. We, as a society have a tendency to view ourselves and others with a critical eye. We are taught early on to look at our deficits and then do all we can to take corrective measures to make up for those deficits. I don’t believe this kind of thinking is helpful with children diagnosed with autism. The deficits pile up unbidden until that’s all we can see. Our children are routinely viewed as “less than” as we struggle to help them. I feel strongly a more balanced approach is necessary. Our children are often brilliant. If I approach Emma with this in mind, I am able to more fully help her, by focussing on her talents, on the things that are easy for her and using those assets to help her with the things that are more difficult. In addition I find I can learn a great deal from her. 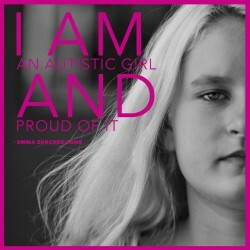 A follower of this blog and mother of two children on the spectrum asked me if Emma used an ipad. I wrote about Emma’s ipad last fall for both this blog as well as the Huffington Post, so in responding to her email, I reread both those posts. 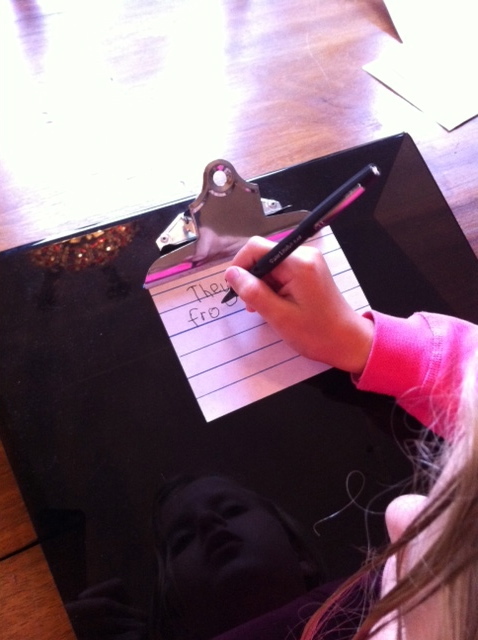 The one for Emma’s Hope Book is entitled Emma and Lists. What struck me was how far Emma has come since then. I looked at the date – September 24th, 2010 – and while yesterday I was feeling a bit discouraged with Emma’s ongoing struggles with handwriting, I cannot help but feel incredibly optimistic with her progress after reading those posts. It’s funny how rereading something I’d written less than a year ago can have such an impact, but it has. Emma has certainly come a long, long way. 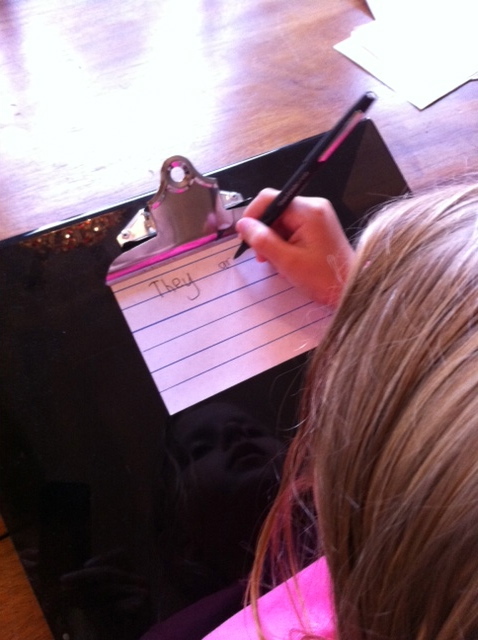 In the post “Emma and Lists” I write about how when I am feeling a little sad or discouraged I make lists. I go on to recount my current lists, (hopes) for Emma. “Help Emma with Reading,” “Help Emma with writing,” are two such items. I remember when I wrote that post, thinking that these were dreams, perhaps dreams I might not ever see accomplished. And yet, here I am in July of 2011 and not only are both these dreams coming true, but so are others that I hadn’t even thought to put on my list. Things like: beginning math concepts, writing in full sentences, learning to type, following three and four step commands. These are all things Emma is in the process of learning. I will try to remember to take a photograph of Emma’s handwriting this afternoon. She is coming along. She is learning, she is progressing. It’s easy to forget, though. I forgot that last September I could only hope Emma might one day learn to read and write. That she is now doing so is remarkable and wonderful. Last fall we were still riding on the wave of our success with having finally gotten her out of diapers at night. We were still struggling with getting her to sleep through the night. I’d forgotten all of that. It seems so much longer than ten months ago. It feels as though years have slipped by. I haven’t dared dream for awhile now. But rereading those posts reminds me of how important it is to have dreams, for ourselves, for our children. For the last three summers we have enrolled Emma in summer camp with her therapist, Joe shadowing her. The director of the camp has been incredibly accommodating, allowing Joe to shadow Emma and doing all he can to provide Emma with a “typical” camp experience among her neuro-typical peers. Each year the other children, while often not exactly clear on why Emma behaves as she does, have been incredibly patient and eager to help when Joe told them she was just learning to speak and sometimes didn’t understand all that was going on. Each summer one or two little girls have taken it upon themselves to help Emma, self assigning themselves to her, urging her to join in and making sure she stayed with the group. The first two summers we signed her up for two weeks and since it went so well, we went ahead and signed her up for a full month, just like her brother, Nic this year. Yesterday was her first day. “No not going to go to Becky’s class. Going to go on the bus to summer camp!” Emma said yesterday morning as I fixed her breakfast. “Are you excited, Em?” I asked. “Yeah, Em. That’s right. It’s a different bus. Which one do you want to wear?” I asked, holding up three different skorts. “This one!” she grabbed hold of a pink skirt with shorts attached. “And this one!” she said taking a white t-shirt from me. “And this one,” she added, pulling a white and blue striped two piece bathing suit from the drawer. “Okay, and how about we take this one for back up?” I held up a colorful one-piece suit in front of her. “No mommy. Just this one,” she insisted, jabbing her finger at the two piece. Emma often reminds me of the children’s book character, Olivia. Olivia is a pig who loves clothes, particularly accessories with stripes and shoots around on her scooter. Which is where the similarities end – not the pig part, just the scooter and love of clothing and striped accessories. When the bus arrived, Emma, Nic and Joe climbed the stairs amid shrieks of excitement and greetings. Several children from last summer were riding the bus again and as the bus moved away from the curb, I could still hear the excited voices of the children. When everyone arrived home yesterday afternoon, I asked Emma if she had fun. 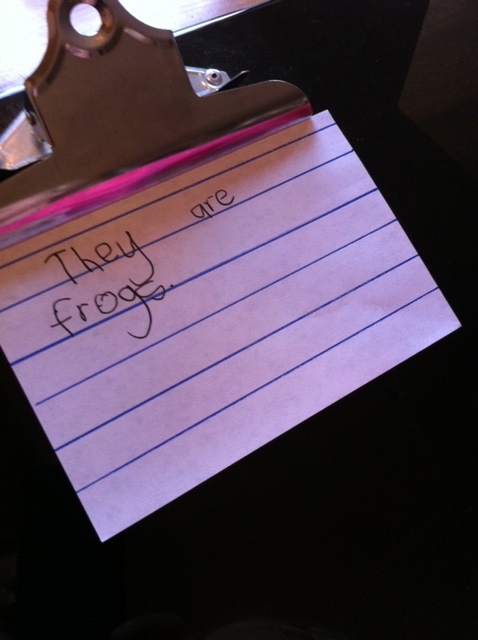 Emma then typed – Yes, these frogs are jumping. Progress, lots of wonderful progress! I first heard that term used in reference to Emma almost seven years ago now. It was one of those things people say, in this case her early intervention therapists, where you hear the words, you know what they are saying, but how exactly this is being applied to one’s own child suddenly doesn’t seem clear at all. Emma, like many children diagnosed with autism, has a difficult time applying something she’s learned in different situations and settings. For example when she was much younger, I tried to teach her what a t-shirt looked like by holding up an actual t-shirt, one of hers with a pink heart on it, she was able to remember what that particular t-shirt looked like and called it a “t-shirt”. If I then took out a different t-shirt, one of mine or a different colored t-shirt from her drawer, she was not necessarily able to understand that this too was called a “t-shirt”. If I showed her a flashcard with a green t-shirt and explained that this was the color green and then pointed to a slightly different shade of green, and perhaps on a chair, she wasn’t able to tell me that the color I was pointing to was green. Temple Grandin, speaks about this at length, she calls it “thinking in pictures.” She says she stores images in her mind and then flips through the images to come up with the correct one to fit the word being used. She then goes on to describe how problematic this retrieval system is for her. One can easily understand how difficult that must be. Over the weekend I worked with Emma on two words: “yes” and “not”. “Yes” was a bit easier for her to incorporate into her writing, but “not” completely threw her. If I said, “Emma, what are these?” and pointed to a picture of three trucks. She answered correctly, “These are trucks.” If I then asked her, “Are these trucks?” pointing to the trucks, she was able to understand that if you answer, “Yes, these are trucks” it didn’t change the structure of the sentence, one just needed to add “yes” to the beginning of the sentence. But if I then asked, “Emma, are these trucks?” while pointing to three frogs, she had a terrible time answering, “These are not trucks.” When I asked her, “Emma, give me the one that cannot walk,” from a field of four objects: a bus, a truck, a plane and a kid,” she handed me the kid. I know Emma understands what “not” means, but in this context she was baffled. It reminded me of those first few years when we were new to all of this, and almost constantly perplexed by almost everything she said and did. I remember watching in dismay as she proceeded to memorize several hundred flashcards that her therapists used with her. The therapist would hold up a card with a picture of a bike, and Emma would shout, “bike!”, the card with a dress, Emma would yell, “dress!” and on it went. I fully expected her to go on to a regular kindergarten, at the rate she was going. But very quickly I realized that though she had no trouble with her memory, could memorize some 400 flashcards, she could not use the information beyond the flashcards. In other words, the information wasn’t being translated across a larger field. She did not use the words, we now knew she knew in everyday sentences. If we went out into the park and I saw a kid on a bike and said, “Em, look! What’s that kid riding on?” she couldn’t tell me it was a bike. It didn’t look exactly like the flashcard with a bike. For one thing it was a kid’s bike and for another it had pink plastic tassels on the handlebars and a little bell with a picture of Dora on it. This bike looked completely different from the bike on the flashcard and so Emma was at a loss as to what this new thing was called. The good news is, Emma now can identify a bike, any bike, but it took awhile. This is what we are up against when trying to teach Emma. 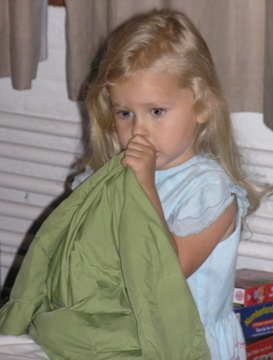 Emma with her green blanket when she was 3. It's easy! Type in your email address and Emma's Hope Book will be delivered to your virtual doorstep. What's Wrong With Autism Speaks? "Rethinking Your Beliefs About Autism"
Can Speech Challenged Students Get an Appropriate Education?